Whether the structure is a historic landmark, or of more recent construction, odds are pretty good that a green roof can be installed much more easily than previously thought. Atlanta City Hall transformed a drab rooftop adjacent to the cafeteria into a vibrant walk-out patio, complete with benches and paths. Despite the weight of living roofs, many are finding that they can be installed on existing buildings much more easily than previously thought. Whether the structure is a historic landmark, or a more recent commercial structure, odds are pretty good that a green roof can be installed on the existing building. The lightweight soil mix and plants serve as ballast, and can weight as little as 17 pounds per square foot. Fully soaked, these systems add about 30 pounds per sq. ft. to a roof’s load. Deeper roof gardens can weigh up to 100 pounds per square foot or more, depending on the depth of the soil mix. 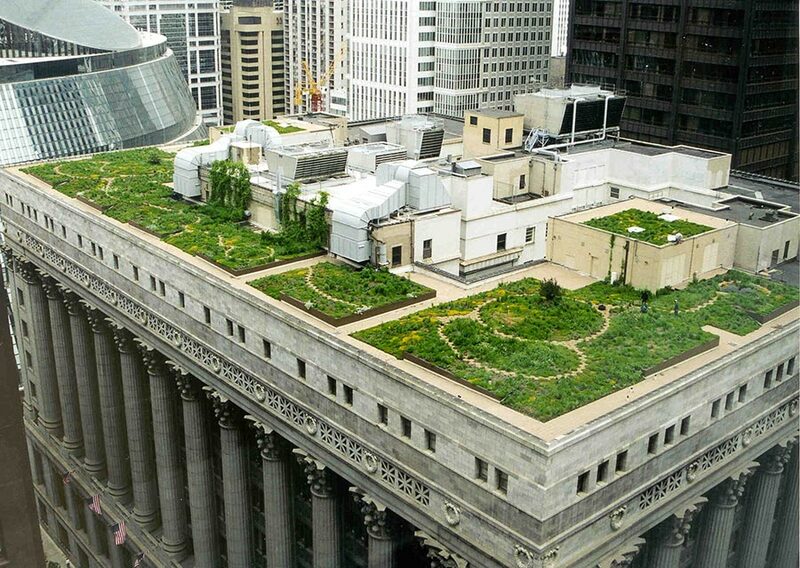 Green roofs and garden roofs provide a number of advantages. Financially, they extend the life of the roof membrane by protecting it from damage and harmful UV rays. They also provide better insulation, and decrease storm runoff. They also provide intangible benefits by providing a beautiful, relaxing location to renew one’s spirit or even socialize. The case studies below demonstrate a few examples of how this has been done. Structures built in the late 19th and early 20th Century are usually significantly “over-engineered,” and can often tolerate a surprising amount of rooftop weight. For instance, Chicago’s City Hall is well over 100 years old. 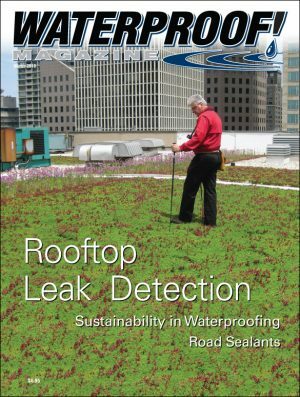 The roof already supported a massive assembly of HVAC equipment, but engineers calculated the thick masonry walls and roof supports could still handle a sizable green roof with very few modifications. Previous layers of waterproofing were left in place and a new liner water proofing system was installed. The roof’s existing gently slope was adequate for drainage, so that didn’t need to be modified either. The only significant structural adaptation needed was a few reinforcements under some long-abandoned skylights. 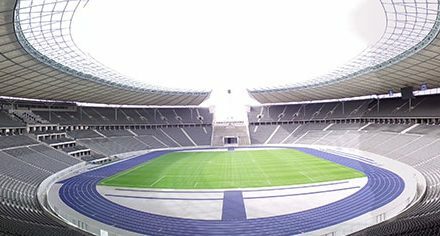 Lightweight insulation boards were used to create the impression of an undulating ground surface. 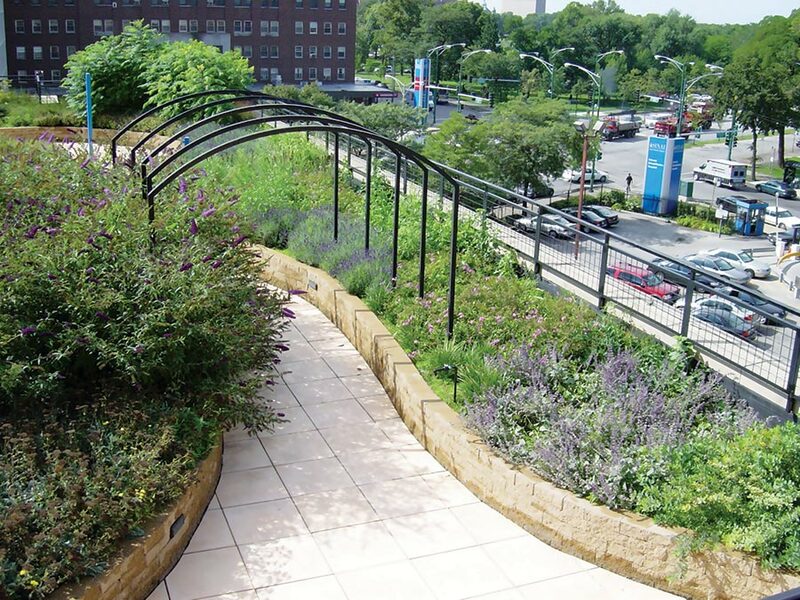 Completed in 2001, the rooftop garden has lightweight soils of 4, 6 and 18 inches in depth, and features more than 100 species of plants. After a summer rain, the roof may weigh as much as 60 pounds per square foot, which the old building has accommodated without a single problem. 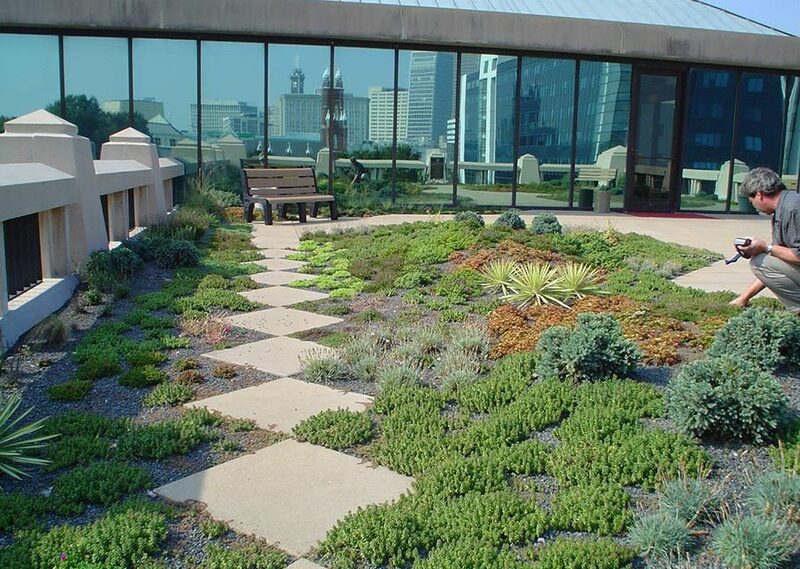 Atlanta City Hall is another fine example of how green roofs can be retrofit onto an existing historic landmark. About 50 years younger than the building in Chicago, Atlanta City Hall is an 11-story Neo-Gothic tower originally completed in 1930. Built of reinforced concrete and covered with a cream-colored terra-cotta veneer, it looks like a Gotham City skyscraper. When the City of Atlanta decided to set an example of sustainability for its citizens, it chose to install a 3,000 sq. ft. green roof on top of a five-story wing of the building. The space once functioned as patio and is adjacent to the cafeteria, so it was a perfect choice for a “walkable” rooftop garden. Like Chicago’s City Hall, the existing structural roof was strong enough that very few modifications were needed. Calculations indicated that portion of the building was designed to hold approximately 560,000 pounds, or 186 lbs. per sq. ft. 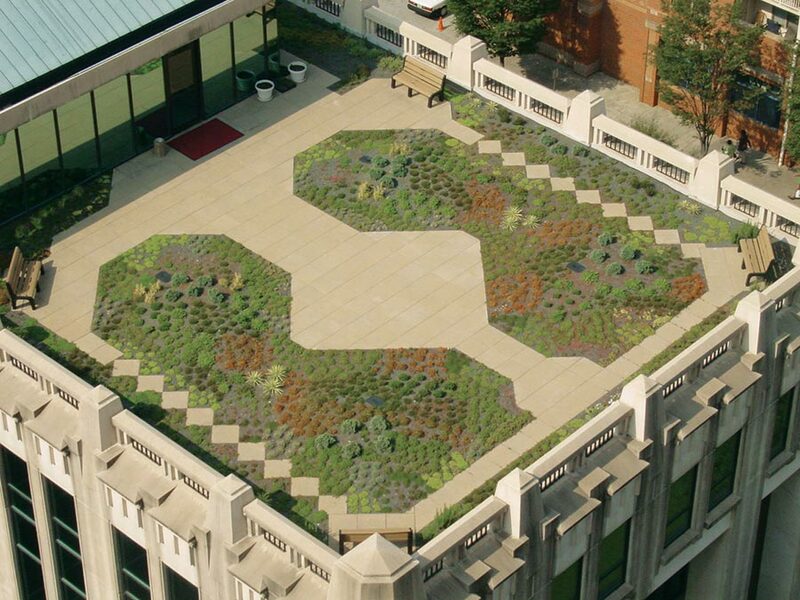 The green roof design, with pavers, plants and 70 cubic yards of soil mix averaged only 58 lbs. per sq. ft.—less than one-third the design limit. 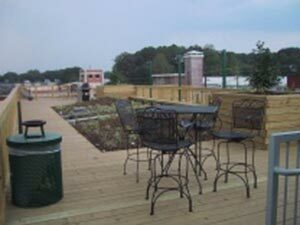 The transition from ordinary roof to garden patio was facilitated by the GRS Green Roof Drainage system from J-Drain. It’s a pre-assembled drain sheet consisting of a high-strength dimpled core laminated between two layers of filter geotextile. It’s simply unrolled over the waterproofing membrane with the dimples facing down. Those depressions will store some excess rainwater while allowing the excess to simple run into the roof’s collection system. The top filter fabric holds the planting media in place and acts as a root barrier. 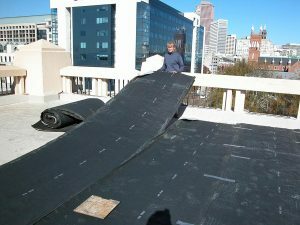 The bottom layer protects the roofing membrane. Soil, installed directly over the GRS sheet, varies from three to 10 inches deep. The landscape plan called for over 2,800 plants from 31 species, with no supplemental irrigation. The plants are predominantly drought-resistant sedums with some perennials, cacti, and herbs. This first phase was completed in April 2004. This green patio atop Atlanta’s City Hall is accessible from the cafeteria, and visible from the upper six floors of the building. 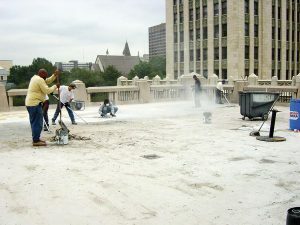 From top, photos show prepping the roof deck, laying out the waterproofing and drainage, and blowing on the soil mixure. 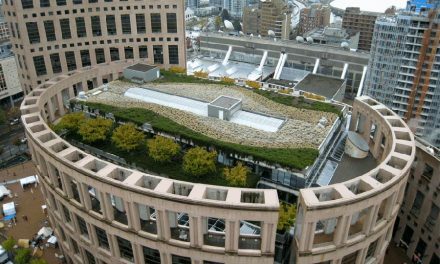 One major purpose of this project was to generate reliable technical data on green roof performance in the region; data such as energy efficiency, stormwater retention, the extension of roof membrane life span, plant survival, and whether they provide any cooling benefits in the summer months. Results have been so promising that Atlanta is adopting a sustainable design standard for municipal financed construction projects. 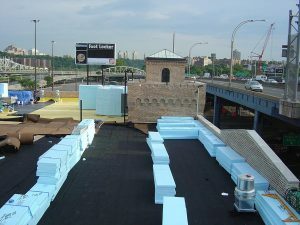 In May 2009, the city began the second phase of the green roof project, installing about 100 sq. ft of “GreenGrid” modules. These are pre-planted trays that simply snap together to form a green roof. They’ve installed about twenty 4” deep and four 8” deep trays for testing and monitoring purposes. Building J, located next to the old Yankees Stadium in New York City, was originally built in the 1920s to serve as the ice house for the Historic Bronx Terminal Market. After the team moved to the new Yankee’s Stadium in 2009, Building J was part of the area included in the redevelopment plan. Due to its historic designation, it could not be demolished. Instead, the 50-foot high brick building was completely gutted and overhauled, including the 12,000 sq. ft. roof. Like the other historic buildings already mentioned, the roof deck already had the capacity to carry the load of a green roof. 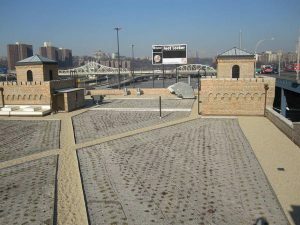 This historic ice house in New York City has a new lease on life thanks to an upgrade that includes a green roof. No significant structural repair work was needed to support the additional weight. 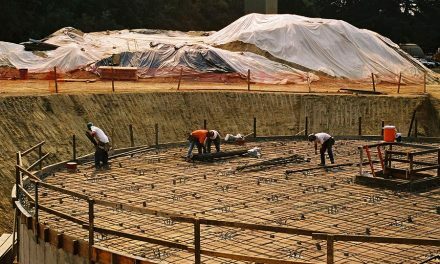 Cetco’s StrataSeal-HR was chosen for the project, but like any HRA it requires clean dry concrete for application. 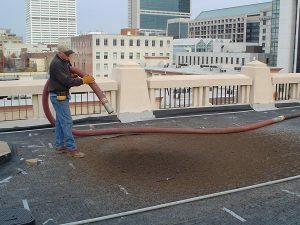 The roofing contractor had to remove the temporary torch-down roof, as well as residual coal-tar from the original roof, and then shot-blasted the entire concrete roof deck. Step-by step, the other components were installed: a 20-mil thermoplastic root barrier, 4” of EPS insulation board (R-20), a stormwater management layer capable of drainage and retention (11 gals. per 100 sq. ft.), filter fabric, growing media and vegetation. Cetco was able to arrange sourcing of the plants within 200 miles to meet LEED requirements. This month, the 14,345 plants are beginning their first rooftop growing season, providing continually-changing pallet of color, texture and blooms through the summer and autumn that will be fully visible from the Major Deegan Expressway. 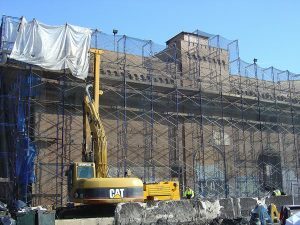 In addition to the aesthetic benefits, the newly remodeled and updated Building J will be more energy efficient, provide relief to the storm sewer systems, and help reduce the heat island effect. A second success story from Chicago is the Schwab Rehabilitation Hospital of the city’s west side. Staff wanted access to a place for horticulture therapy, a widely recognized method of helping patients improve mind, body and spirit through exposure to plants, gardens and gardening activities. However, finding a “natural world” setting for these activities in a dense urban environment was no easy task. 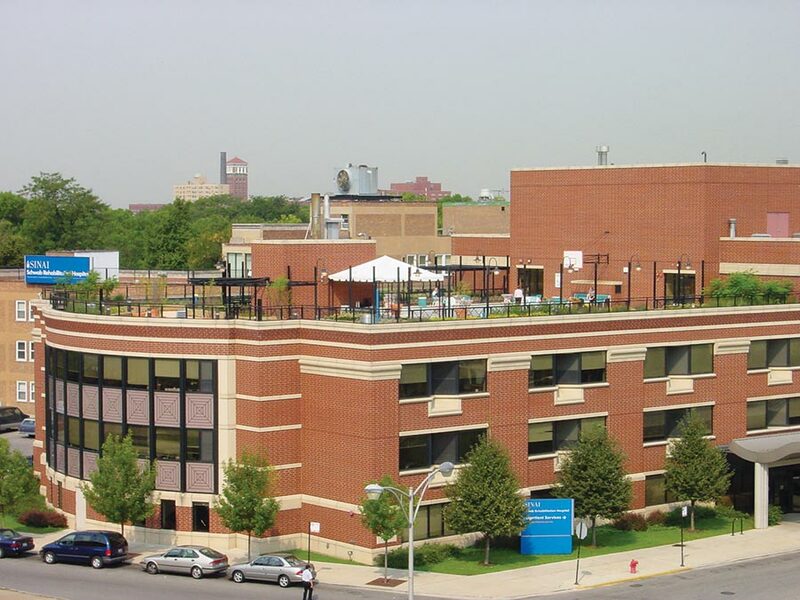 Hospital executives determined that a rooftop garden would meet those needs. 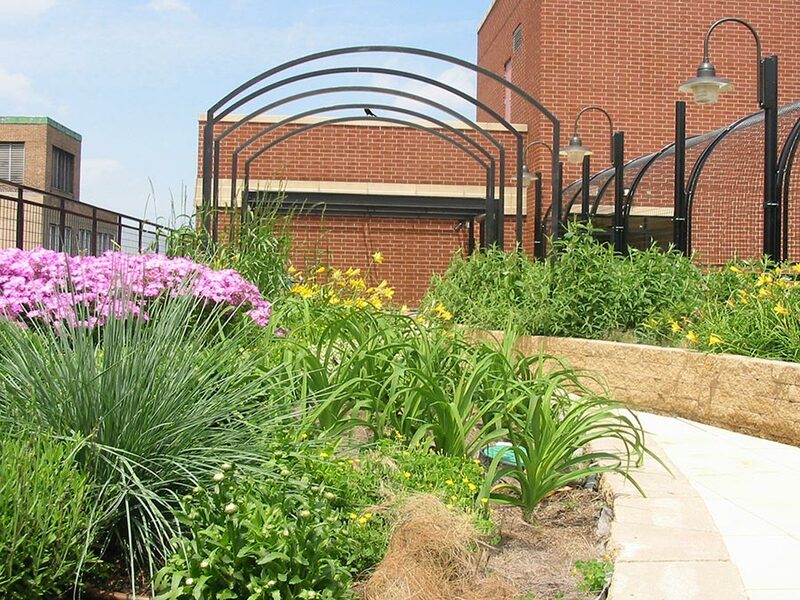 Initially, funding for the project presented a major hurdle, but the landscape architect discovered the city was offering green roof grants under its Urban Heat Island Reduction Initiative. The hospital received a $400,000 grant in 2003. Originally build in 1998, the building had been designed to support an additional floor for a potential future expansion, so there were no structural issues regarding the 50 to 80 pounds per sq. ft. load the green roof would add. 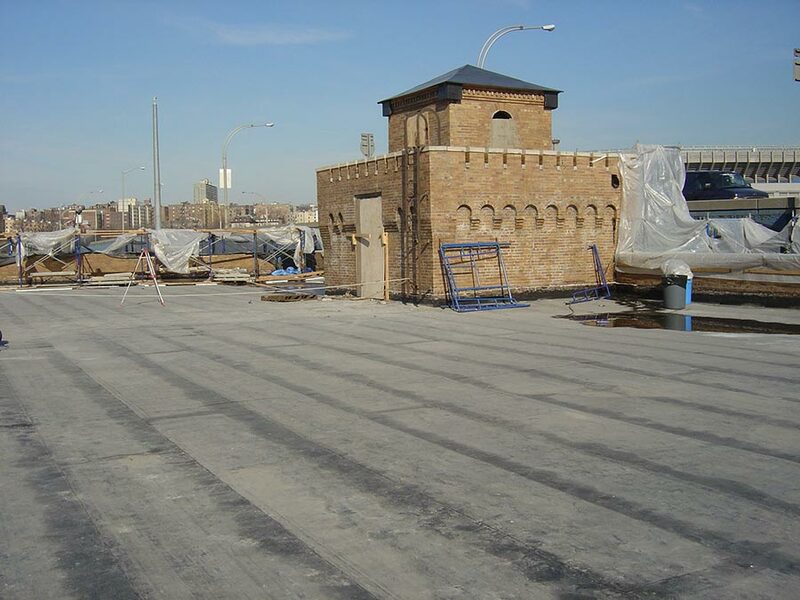 The existing rooftop drainage was also deemed adequate for the 10,000 sq. ft. project. 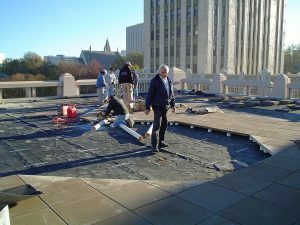 The original roofing contractor was brought back for the green roof retrofit. After removing the ballast and insulation, the existing five-year-old membrane—a hot-applied rubberized asphalt—was given a second coat of the same product. A fiberglass-reinforced protection sheet was embedded in this while it was still hot. 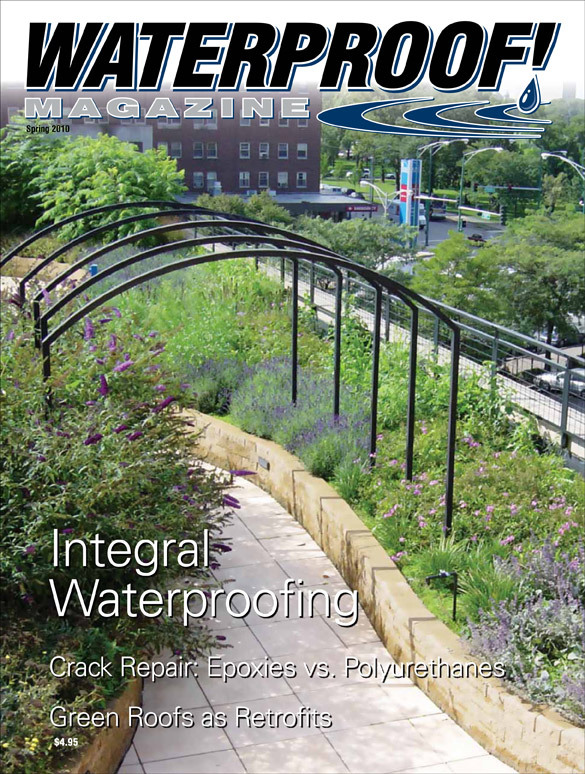 American Hydrotech, which supplied both of these products, is a leader in green roofing products, so the rest of the assembly went forward without delays. After the waterproofing was in place, a root barrier was unrolled and the salvaged EPS insulation was reinstalled over it. Like Atlanta City Hall, this building used a dimple sheet topped with a geotextile filter fabric to retain moisture. The Hydrotech version is called Floradrain 25. Finally, the soil and drip irrigation system was put into place. The final design includes planters and trellises, raised beds and a secluded waterfall, connected by a meandering path that provides gathering places and solitude. But what if the structural roof simply won’t support the weight of a green roof? This final case study of an old Atlanta, Ga., bakery provides one possible solution. Constructed in 1930 for the Atlantic & Pacific Tea Company (A&P grocery), the building served as regional headquarters and bakery that operated for the next 46 years. The red brick and concrete exterior with glass brick is typical for its time. Abandoned in the mid-1970’s, the building was purchased in 2001, and converted into condominiums. Developers realized the flat roof could potentially offer an unobstructed view of the Atlanta skyline, an amenity that would help fill the building to capacity. In 2007, the owners decided to capitalize on the potential and add a rooftop observation deck with vegetated areas. To deal with the weight limitations imposed by the old building, engineers called for a structural steel frame to raise the green roof 6” off the existing roof deck. 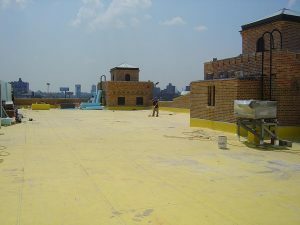 The green deck was also limited to a small portion of the total roof footprint. The roof features planters and trellises, raised beds and a secluded waterfall, connected by a meandering path that provides gathering places and solitude. 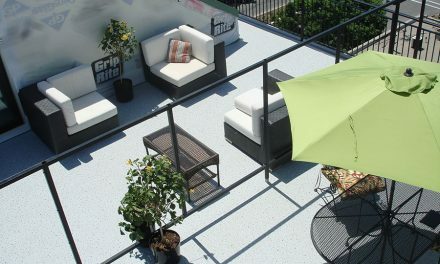 The A&P Lofts demonstrate how green space can be added when the roof deck cannot support the weight. Once the metal deck was installed, construction was fairly typical. A fluid-applied waterproofing membrane was applied to the steel, and a layer of J-DRain 302 was installed on top of that to allow water to get to the outlets. EPS insulation board was installed on top of the 302 to further reduce soil weights. A water retention mat installed on top of the insulation board captures rainwater for the plants, followed by eight to 11 inches of growing medium. Completed in July 2007, all residents have access to the rooftop garden, which provide shade and green space for residents to relax, as well as a water feature, and stainless steel grills for outdoor cooking. With the growing green movement, vegetated roofs will become increasingly common. 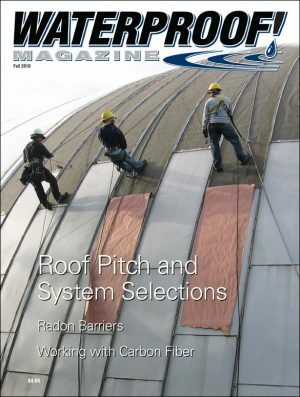 Designers and architects are realizing that this type of roof can be installed on many existing buildings to improve performance and occupancy rates. 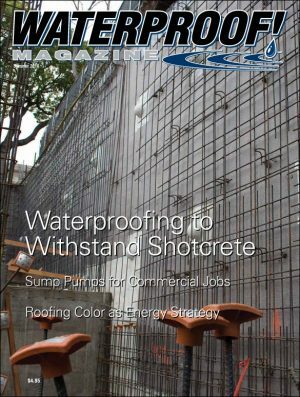 Contractors asked to participate in this sort of project should recognize that whether it’s a 100-year-old city landmark or a recently completed office building, a handful of waterproofing suppliers are standing by with the materials, knowledge and experience to make it happen.